Leave it to the French to take a pedestrian grilled ham and cheese and elevate it to something, well, so decidedly decadent. I was nearly giddy with delight as I sampled my creation(s), or properly, Julia Child’s creation. While many variations are floating about, I picked this version from my 1977 edition ofÂ From Julia Child’s Kitchen . This dish is all about simplicity and fresh ingredients. Of course, Julia had a way of making even the most complicated French dishes accessible to the home cook, yet she had an equal love for ordinary fare. She was quite literally a legend in her own time, and what better way to honor her memory than by preparing one of her favorite dishes, Croque Monsieur. August 15 would have been her 100th birthday, so her publisher, Knopf (#JC100), along with PBS (#CookforJulia) and food bloggers around the world (#SundaySupper) are celebrating. Why not join in the fun? 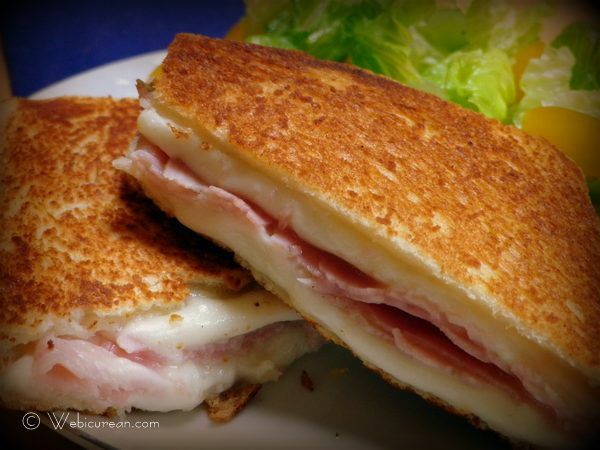 According to the The Oxford Companion to Food , Croque Monsieur literally means “crunch-sir” or “munch-sir,” but its origins are not clear. This popular French snack first appeared on French menus in the early 20th century. Its sibling, the Croque Madame, is a more recent invention, with the addition of chicken, or a fried egg on top. While I tend to believe everything tastes better when topped with a fried egg, I’m a purest at heart. Well, almost. 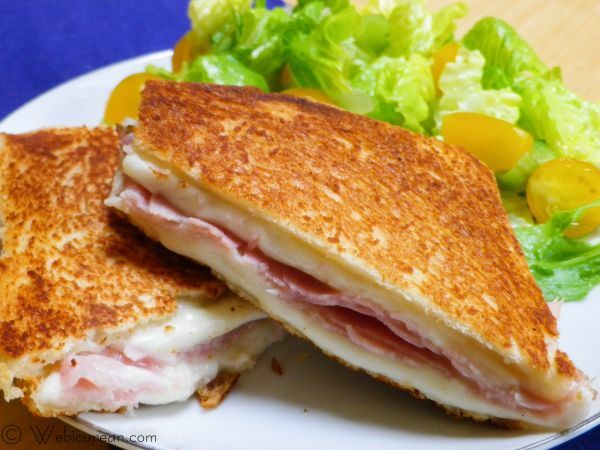 Traditionally, the sandwich should be made with EmmentalerÂ or GruyÃ¨re, but Julia recommended fresh MozzarellaÂ because its “softer consistency blends more meltingly with the ham, the butter, and the bread.” I couldn’t have said it better myself! This binge spanned a good four days as hubby and I sampled a variety of cheeses and hams. (These sandwiches are so rich, you really can’t eat more than one per day.) There was no clear winner–sandwich or waistline–but if I must choose, I’d pick the fresh Mozzarella with rosemary ham with only a slight edge over the Emmentaler with Black Forest ham. Both were sandwiched between slices of fresh “famous bake house white” from Safeway’s bakery, which was surprisingly irresistible on its own. So grab a stick of butter, some bread, ham, and cheese, and let’s begin! 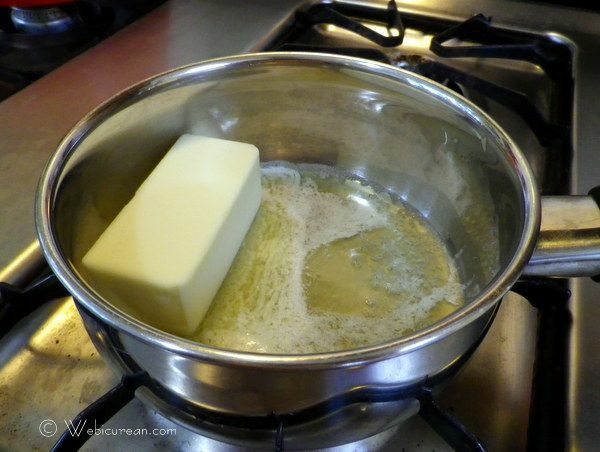 First, we must clarify the butter, which simply means melting butter then skimming off the milk solids. This gives the butter a higher smoke point and will prevent it from browning/burning when sautÃ©ing the sandwiches. Next we need to line up our ingredients–bread with crusts trimmed, slices of cheese and ham. As you can see, I had a hard time getting “thin” slices of the Mozzarella. Oh well. Before assembling, brush the bread with clarified butter. Then layer the cheese, the ham, and the cheese. Yep, I said cheese twice. Then slowly sautÃ© in clarified butter until golden melty goodness. I know, that makes no sense, but you get the picture. And enjoy with your favorite salad and a glass of wine! Or, cut into bite sized pieces and serve as an appetizer. Either way, it’s sure to be a hit. 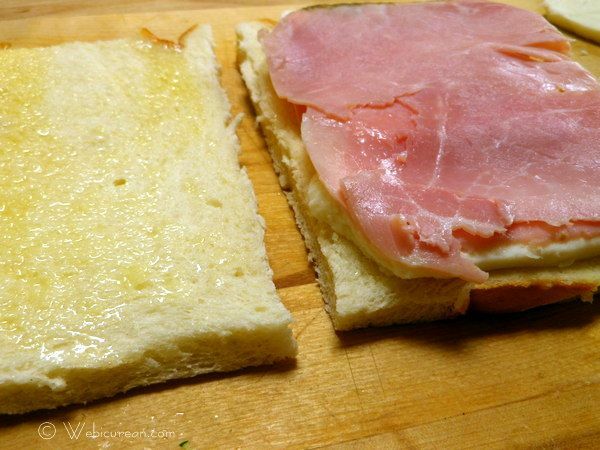 For each sandwich, lay a slice of bread on your work surface, brush it with clarified butter, cover with a slice of cheese, a slice of ham, another slice of cheese, then brush one side of the second slice of bread with butter, and lay it buttered side down on top of the sandwich. Now press the sandwich together firmly, leaning on it with the palm of your hand. Trim off crusts, and press down again on sandwich. Film a frying pan with ⅛ inch of the clarified butter, heat to bubbling, and brown the sandwiches rather slowly (2 to 3 minutes) on each side, so the cheese will melt; add more butter as needed. For appetizers, cut the sandwiches into quarters or eighths. If done ahead, arrange on a baking sheet and set aside, covered with plastic wrap. Uncover and heat in a 375-degree oven 5 minutes or so before serving. Join in this week’s #SundaySupper festivities, starting with the recipes below and ending with a live chat beginning at 7:00 p.m. EDT, hashtag #SundaySupper on Twitter. Provencal Tomato Quiche byÂ Are you hungry? Oeufs Ã la Diable byÂ What Smells So Good? Note: I earn a modest referral/commission for Amazon.com links within the article. I have always loved this sandwich. The gooey cheese with the pan fried bread-YUM! Yours look delicious. Sometimes a simple sandwich is all you need for a fantastic meal. This is one of those sandwiches. Yum! Thanks–I’m still marveling over your beautiful salad! 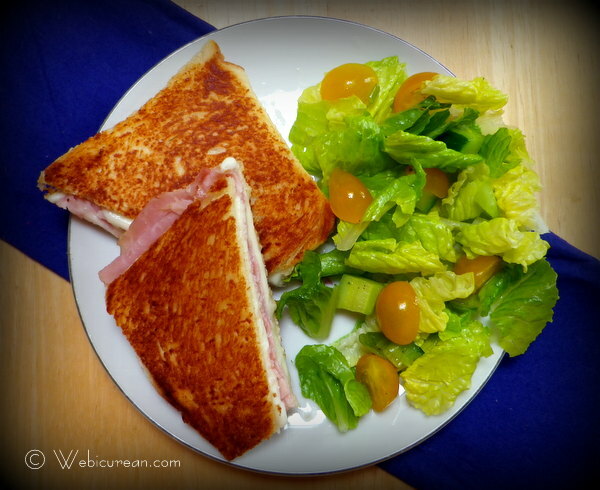 Anne, you make grilled ham and cheese look so special! A simple yet decadent sandwich! Great lunch with the salad you paired it with. Nice step-by-step pics! Thanks! You know, I’ve been craving Israeli salad lately, so I tossed one up with what I had on hand! Oh it makes perfect sense! And it looks perfectly delicious! This is absolutely one of my favorite sandwiches in the world! I wish I could reach in and grab one for myself. Lovely write-up! lol thanks I think I ate too many during the writing of this article! I know what you mean about French cooking. What a fabulous and decadent sandwich! I ate so many of these, I’m almost afraid to try the Madame! You made this sandwich look absolutely amazing! I am so glad you are part of #SundaySupper and love your recipes and inspiration. Thanks for including me in the group–I’m thoroughly enjoying participating! Ooo I love all of these flavors! So yummy! WOW! Your toast is browned so nicely ( I always burn toast). Love the accompaniment of the cucumber and tomato salad. These were a favourite of mine and Dad’s growing up – we never did the “sliced cheese” thing! ha well I thought I’d cheat a little as TJs had a log of presliced fresh mozzarella–but the slices still needed slicing as they were too thick as cut! Croque Monsieur and Croque Madame are my favorite French sandwiches and often order one of them if I’m at a bistro. 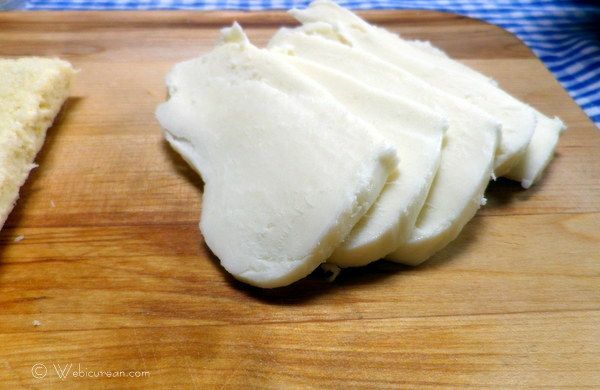 Looks great and I love your mozzarella twist on the classic! OMG can you say rich and yummy!! Guess what, hubby requested grilled ham and cheese for dinner last night, no joke. Your AMAZING display tells me without doubt, he would totally flip over this sandwich. Love the use of mozzarella cheese. Can I crawl through the screen and have a bite? Just so amazing! I would love to have one of these right now!! Gooey, buttery ham and cheese. Can’t get much better than that. Okay, now I’m hungry! I love grilled cheese sandwiches made just about any way. I’ll have to try this one! 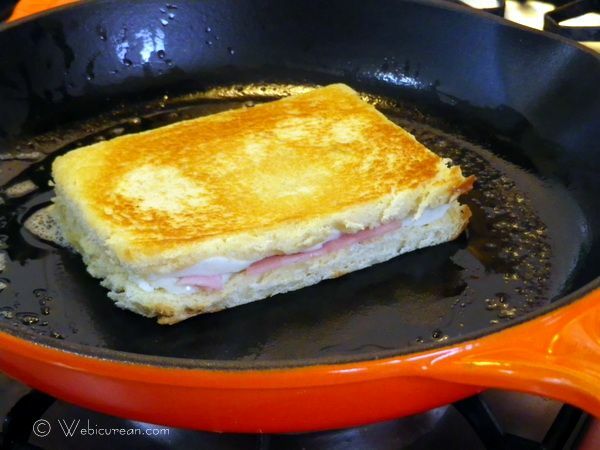 What’s not to love about grilled cheese with ham, sauteed in butter. I also love your side salad! This is fabulous. I adore the fact that this is an elevated ham and cheese. Makes me grin. I must try this. 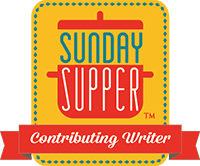 I love your writeup for this week’s #SundaySupper, and really enjoyed reading the quotes you shared with us. Thanks 🙂 And what’s not to love about Croque Monsieur! Grilled cheese is so versatile! Yummy, gooey deliciousness! I know, I was pretty liberal with the butter on this sandwich!